A few months ago, Patrick Whitney and Matt Mayfield invited me to teach an intercession course on Entrepreneuring at the Institute of Design (ID) at the Illinois Institute of Technology. 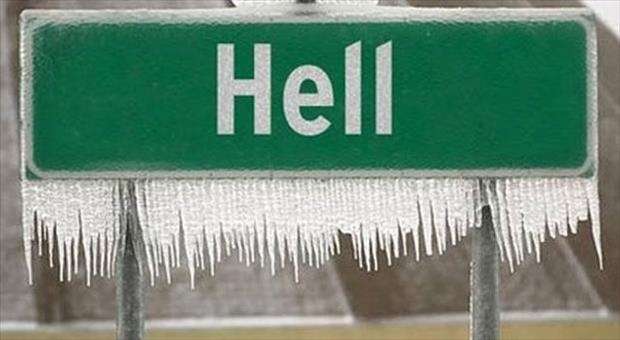 I figured that by March 3, Chicago would be out from under the brutally cold winter weather. Wrong. I got my own week long full fruity flavor of the deep cold and snow of a Chicago winter. However, the warmth of the welcome from former students, current professors, current students and new friends from my public lecture on “Discovering, Developing and Trusting Your Inner Entrepreneur” made the trip beyond worthwhile. One of the many gifts of teaching graduate students who are working professionals is that our paths continue to cross over the years. It was a delight to see so many former students from the ten years that I taught at ID during the 1990s. I was excited to find that he tweeted out one of the sidebar comments “Find. Copy. Paste. Tweak.” is the new black when it comes to computer programming and the “maker” world. 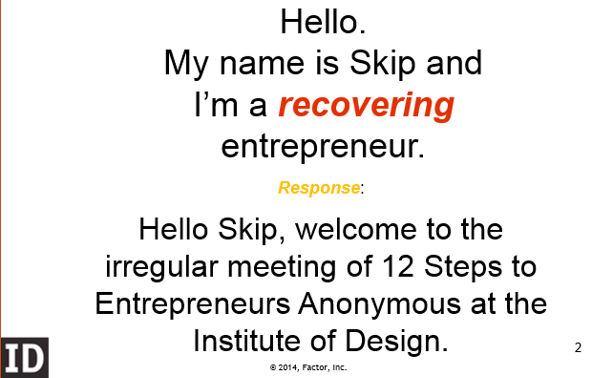 As with all Entrepreneur’s Anonymous meetings we closed with the Entrepreneur’s Serenity Prayer. Raina Russ and Ashley Lukasik did a great job organizing the event. They shared that there was a lot of interest from students and ID community members in entrepreneuring who couldn’t spare the time for the intercession course. They hoped that I could share what the world of entrepreneuring looks like on the west coast (Silicon Valley and Seattle) and how designers can link up with the entrepreneuring ecosystem. 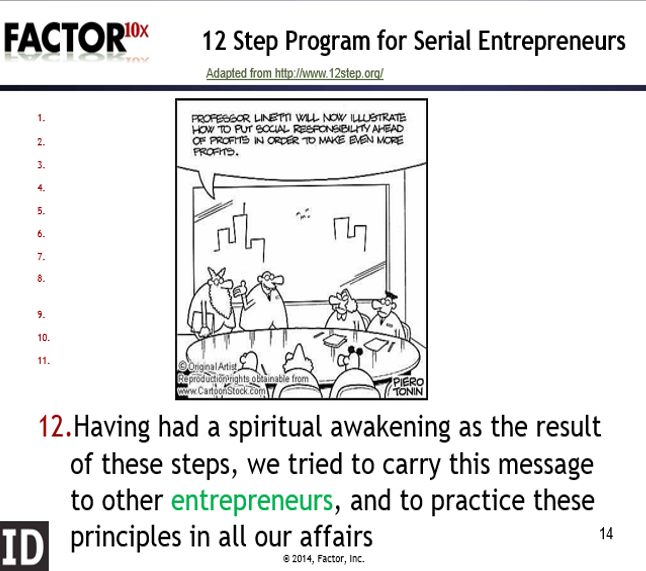 The slide deck from the talk “Discovering, Developing and Trusting Your Inner Entrepreneur” can be found here. 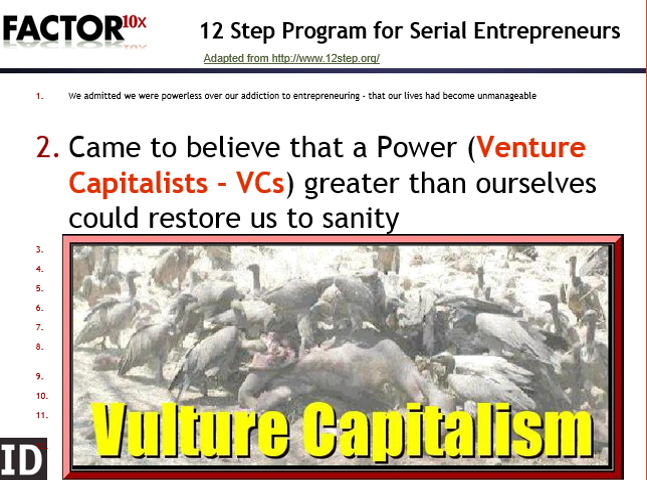 The core theme of the talk is that there is an incredible richness of resources for the entrepreneur. However, the entrepreneur quickly finds that many of the resources and “helpers” advice is in conflict. What David Robinson and I call “mentor whiplash“. One of the surprises of the evening was finding out that a reporter from the Chicago Tribune, Cheryl Jackson, was covering the event. Once again I am reminded to always understand who is in the audience. She wrote the following in an article titled “Why the business should get more attention than the product“. 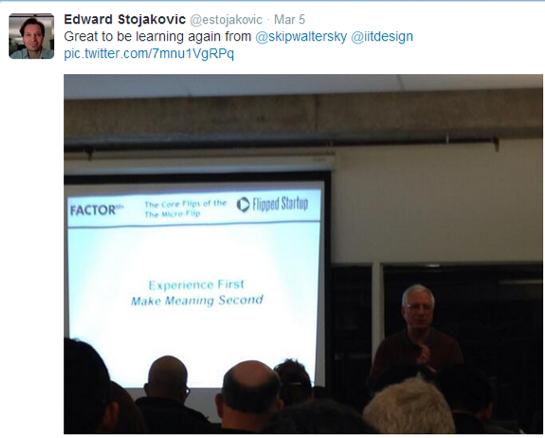 The average entrepreneur often pays too much attention to the product, and that’s a mindset that needs to be corrected, executive coach Skip Walter said Wednesday during a talk at IIT Institute of Design. 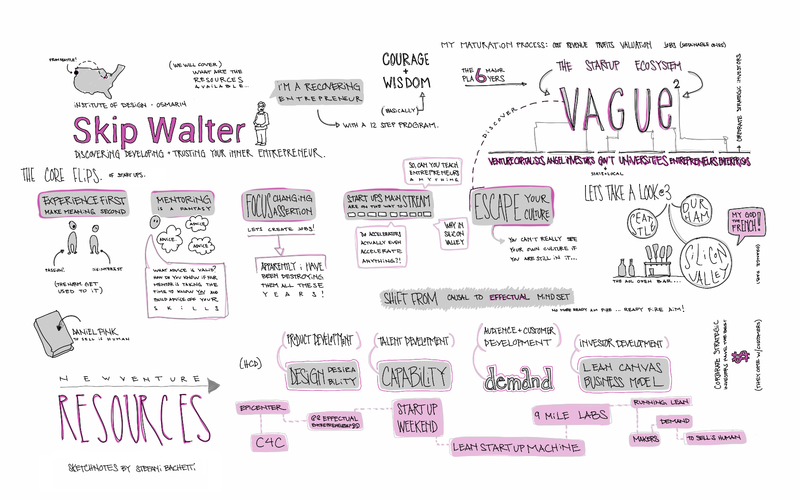 Rather than product, entrepreneurs need to focus on the valuation and the exit, Walter said. Entrepreneurs also tend to overlook better sources of money, he said. They often have friends, family, angel investors and venture capitalists on their radar but don’t consider corporate investors, who could do double duty – provide funding outright to a budding enterprise and buy services or products from that business, Walter said. “And you’ve got your exit partner,” he said, adding that such relationships often have larger companies buying ones in which they have invested. Until they are flush, startups need to do a lot of experimentation, he said. Instead of the ready-aim-fire method of corporations, smaller operators need to think ready-fire-aim, Walter said. 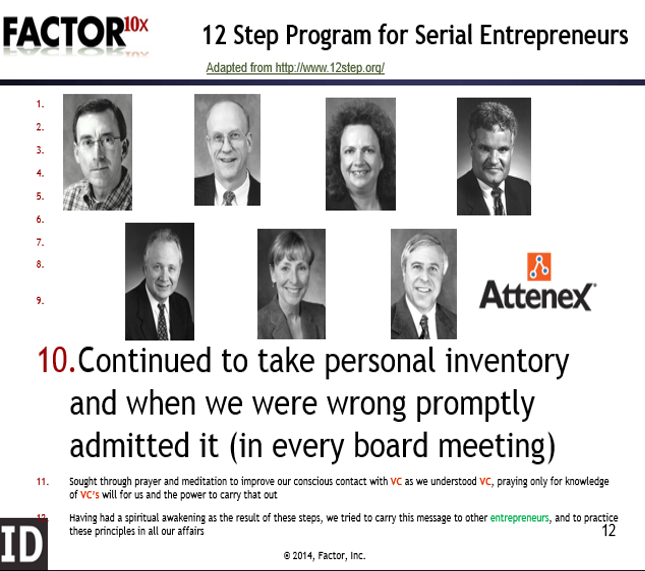 Walter was founding CEO of Attenex, which was sold to FTI Consulting for $91 million in 2008. He has raised more than $25 million in new venture funding for companies, and he said it’s easier to launch a technology business than when he started. Thank you Stefani for summarizing the talk better than I ever could. This entry was posted in Design, Emails for Young Entrepreneur, Entrepreneuring, Flipped Perspective, Human Centered Design, Learning, User Experience. Bookmark the permalink. Inspiring and insightful, as usual. The slides are loaded with gems of wisdom. I was unaware of Edward T. Hall’s “Silent Language” … I first encountered his ideas on proxemics (and the 4 zones of interaction – intimate space, personal space, social space and public space) during my work on place-based social computing years ago. I didn’t know about his broader cultural observations and insights (e.g., “Culture hides much more than it reveals, and strangely enough what it hides, it hides most effectively from its own participants”, on Slide 12). 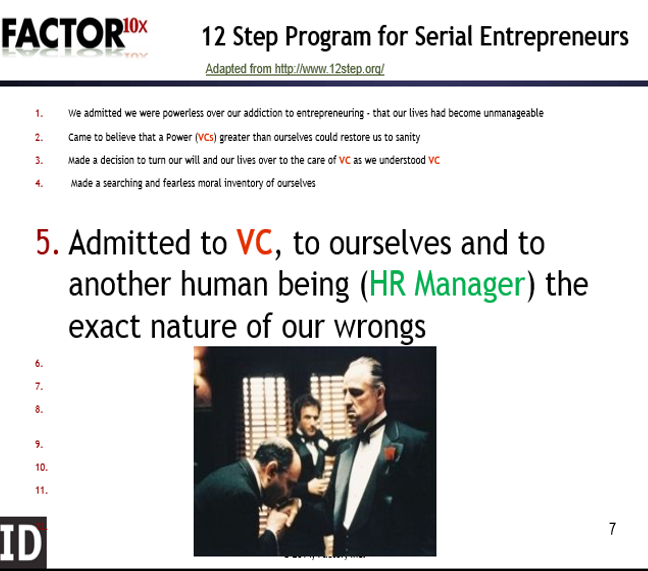 The wisdom of Mack Hanan & Peter Karp on Slide 33 (“How do you grow your business?” “You cannot.” “You can only grow someone else’s business.”) also resonates, reminding me of a maxim I once saw on Twitter: “If you want to make money, help others make money”. 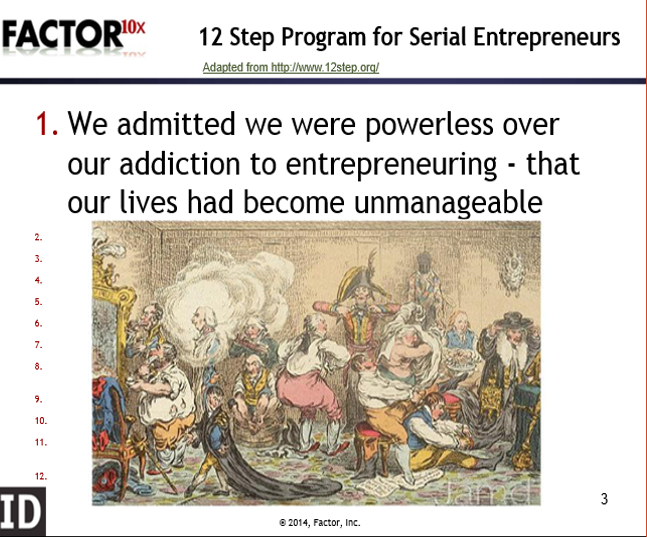 The only quibble I have is with the visualization of the Entrepreneur’s Journey (Slide 21), which depicts the journey as a steady upward climb. My own entrepreneurial journeys might be more accurately depicted as dark nights of the soul. But perhaps that says more about me than entrepreneurship.